When you learn something new, pleasure is released to encourage you to do it again. You can also recognize other people as similar to yourself, meaning they have the potential to experience the same pleasure as you. Sharing is an attempt to give pleasure to other people. The pleasure can come from new information or something real but regardless of what is shared, the intention is based in love. If you have a box of cookies, your brain releases pleasure when you taste the sweet sugars. You know that the characters you create have the capacity to feel the same pleasure you feel. Sharing is partially caused by completion: giving a friend a cookie will give you perceptive data of how they react to the gift. The rest of sharing is done out of love. 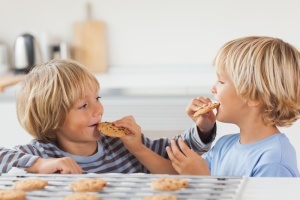 You know that eating the cookie gave you pleasure so you can anticipate your friend will feel pleasure too. Every child wants to share the things they know, just ask a kid a question and see for yourself. The desire to share doesn’t stop when you grow up. People love to talk about themselves because they know a lot about themselves. These people are still attempting to share information with you, it’s just specific to them; if you let them talk you can see the love in their intentions. Education is merely a societal form of sharing where experienced individuals can share their knowledge with the next generation. You have a natural tendency to want to share what you know since you already know it. To learn as much as you know, you likely had to feel an attraction to the subject which means your love is synapsed to it. When people are given the opportunity to teach what they are passionate about, love pours from their eyes and soaks every word they speak. When you hear a joke, you immediately want to tell your friends. You want to give them the same pleasure you experienced. When you come home from work, you might want to share your pleasant or horrible or weird experience hoping to elicit sympathy from your roommate. Think about it, when you’re having a good day you want to give your positivity to others but when you’re having a bad day… well we’ve all been there. Your innate desire to share is what makes keeping a secret so difficult. When you are told something is a secret, it means there is a person who is not supposed to know what you know. You will then synapse that fact to the newly formed neural cluster which means you will get curious as to what they would do if they knew. When an idea is finally communicated, it becomes cemented which also completes a part of the cluster. Secrets are understandably difficult to keep, you must resist a release of pleasure from sharing your knowledge. Sharing your thoughts is one of the greatest parts about socializing. It lets you cement your own neural paths and gives others a chance to build a character of you. You are unique, just like everyone else, which means your knowledge is unique to only you, just like everyone else. Unfortunately, many people anxiously avoid sharing their thoughts out of fear of bothering you with their burden or a bad story. Remember to look for the intention and trust others to do the same. Communicate with others, learn from them, teach them something you know, share your love for what you know. Sharing is caring; it is literally a way we communicate love and it’s one of your greatest Powers. Find a way to share something you know or own and open yourself to the possibility of someone sharing with you. The more we share with each other, the better off we all are.